Andy Murray can sleep well tonight. The British number one is safe in the knowledge that he does not have to get up in the morning and go back to work. He's beaten John Isner - and the unpredictable Paris weather - to book his place in the quarter-finals. There he will face either France's Richard Gasquet and Japan's fifth seed Kei Nishikori on Tuesday. Gasquet currently leads 6-4 6-2 4-5 - head over to our live scores page to see how that one pans out. "Andy really is a clay-court player of some substance. To win in straight sets against John Isner is always a battle because of his big serve. But Murray scowled and grumbled his way throughout it, as ever, but he got the job done tremendously well." Andy Murray, speaking on Court Suzanne Lenglen: "It was very important to win that first-set tie-breaker. It was a very close opening set and it could have gone either way. "I got lucky with the opening set point that Isner had in the first, I guessed the right way and got the winner. "Murray deserves the applause from the crowd. He's done very well to come back from the stressful start he made to the tournament with two straight-set victories." Andy Murray reaches the French Open quarter-finals for a sixth time - that's now the most by any British male. Fred Perry managed it five times. All over! 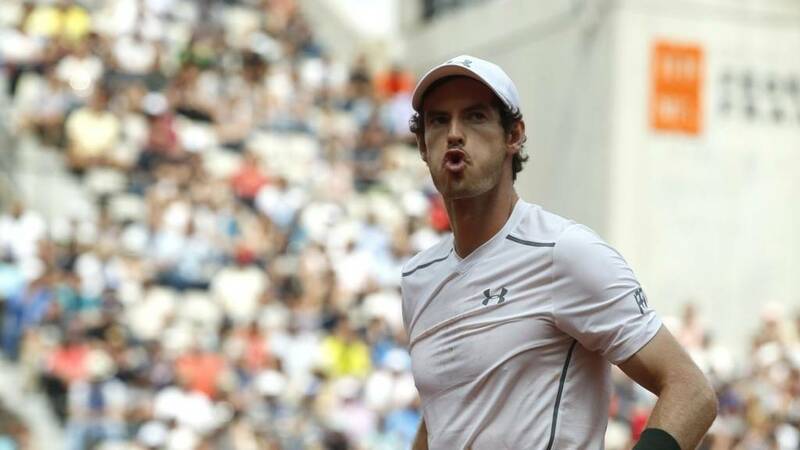 Andy Murray reacquaints himself with the Roland Garros quarter-finals. He needs two hours and 40 minutes to see off John Isner and, ironically against the American serve-machine, crashes down an ace to seal a straight-sets victory. Murray's tennis tourette's is going into overload. The Scot uncontrollably splutters out a string of swear-filled sentences as he fails to shake off Isner. The Briton is pegged back again and again by his American rival, not helping himself with a double fault for 30-30 mind. Isner earns himself a break point, only for Murray to pull an ace out of the top drawer. Timely.. Anyone got a 'get out of jail free' card? John Isner needs one. The American loses his cool, a double fault handing Muzza another break point. Ah, here it is! Isner aces his way out of a sticky spot, backing it up with a couple of decent points. A forehand smash close to the left-hand net post ends Murray's hopes of a quick finish. "Do you ever think what it must have been like in the Murray household when he opened his Christmas presents and didn't get what he wanted?" Over on Chatrier, Richard Gasquet looks on course to set up a quarter-final meeting with Andy Murray. The Frenchman, carrying the home hopes after Jo-Wilfried Tsonga pulled out yesterday, is two sets up against fifth seed Kei Nishikori. Neither player can grab this deuce by the scruff of the neck. Advantage Isner, advantage Murray, advantage Isner. Anyone going to see this one through? Murray tots up a third break point - after Isner argues that Murray's forehand return didn't hit the whitewash. Sorry John, it did. Murray starts to win the arm wrestle in the decisive point, pumping the ball at Isner's suspect backhand. The pressure tells and Murray claims that vital break. Isner takes a moment to change his racquet, but it doesn't help his returning game. Murray is trundling along rather smoothly now. Another comfortable hold - this time to love - for the second seed. Murray will be hoping to crack on with this and see off Isner in three - like he has in their three previous meetings. Isner recomposes himself after a sticky start following the rain delay. Murray is sniffing at 40-30, but an Isner ace - his 15th of the afternoon - clinches the hold. Want more good news Andy Murray fans? John Isner must do something he has only ever done once before - fightback from two sets down. Murray to open this third (and final?) set...and it is a straightforward hold.